The hand is one of the most complex parts of human body – the movement of the tendons, bones, tissues and nerves allows you to grip and do a wide variety of complex jobs. Without hands it would be extremely difficult to do routine, simple tasks such as opening doors, using a fork, or tying your shoes. Your hands make you a skilled, valuable worker and person. A disabling hand injury can have a dramatic effect on your quality of life. A hand injury can impact not only on your ability to perform your job, but daily routines as well. A hand injury can occur in a second, but the social, financial and emotional effects can last a lifetime. According to government and industry statistics, hand injuries represent nearly a third of all reported workplace incidents. Approximately 75 percent of industrial injuries that cause partial disability involve the hands – more than 16 million individuals seek emergency care each year for hand injuries. Based on the Bureau of Labor Statistics (2006 data) nearly 205,000 injuries and illnesses to the wrists/hands/fingers involved days away from work in 2006; that is, 27 percent of the total for that year. It’s not so easy is it? Hands are important – this is a fact. In order to build a proper hand injury prevention programme it is not enough to simply distribute protective gloves to all affected employees. This will not help. Before you establish a proper programme to prevent hand injuries, an employer has to understand the basic hierarchy of hazard control first. Hierarchy of hazard control is a system used in industry to minimise or eliminate exposure to hazards. It is a widely accepted system promoted by numerous safety organisations. This concept is taught to managers in industry, to be promoted as standard practise in the workplace. Various illustrations are used to depict this system, most commonly a triangle. Personal Protective Equipment (PPE) has lowest effectiveness and overall, companies should work in the direction from the top to the bottom of the triangle to improve safety, and levels of protection of the workforce. Elimination of the hazard is the most effective means of hazard control. It involves the physical removal of the hazard; for example, if employees are required to use aggressive chemicals to perform specific analysis, the best way is to eliminate a need to perform this type of analysis, or, if you replace it with an instrumental one, the hazard can then be eliminated. PPE is the least effective way to control hazards. PPE can include gloves, respirators, hard hats, safety glasses, high visibility clothing, and safety footwear. PPE is the least effective means of controlling hazards because of the high potential for the PPE to become ineffective due to damage. Additionally, some PPE, such as respirators, increases physiological effort to complete a task and, therefore, requires medical examinations to ensure the worker can use the PPE without any detrimental risk to his or her own health. Ok, we’ve tried other measures and are at the bottom of the triangle now. How do you select the right type of protective gloves? Currently there are plenty of different types of protective gloves on the market as well as materials for gloves manufacturing (see below). Let’s have a look at the potential hand hazards that exist for a specific worker or specific task. 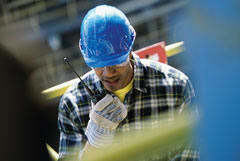 These things can be identified by undertaking a Job Safety Analysis or Job Risk Assessment. When choosing work gloves, reflect on the characteristics the work gloves should possess, rather than choosing one based on its price tag. This does not mean the price should not be considered at all, but rather know that buying quality gloves might cost a little more. The material the work glove is manufactured from will also be a factor in determining how strong a work glove is, and how much protection it can offer you. This is reflected in the hazards a work glove will deal with, and is something to think about. For example, a latex disposable glove will be useless at offering hand protection when using chemicals with the potential to spill or splash. A stronger glove made of rubber material, or a leather work glove would be better. Another factor to consider when choosing industrial work gloves is the type of work the glove is reserved for. A glove made of a material easily broken down, or not able to withstand wear and tear, would be of little value in the construction industry, where a pair of gloves made of a durable material would be better. Handling of chemicals is one of the high risk activities requiring specific effort with protective gloves selection. Inappropriate selection, service, inspection and training of the end user on how to use PPE properly may result in unpleasant consequences for both sides – the employee and employer. We have to understand that not all of the chemical resistant gloves materials are adequate and in some cases deeper study of the subject is required. For example, on the table below you may see some limitations for the chemical resistant gloves materials. When you don’t know what kind of chemical mess your hands are getting into, reach for a pair of Nitrile work gloves. This synthetic glove offers ideal resistance to many hazardous chemicals and chemical solvents; resists cutting and punctures and provides flexibility. Nitrile gloves can handle a wide range of temperatures and protect against caustics, oils, kerosene, turpentine, greases, herbicides, pesticides, acids, naphtha and alcohol. These hard working gloves are used by farmers, landscapers, commercial cleaning people, painters and maintenance workers. Anybody, in other words, who wants to protect their hands from chemical attack. Like all other items used for industrial protection, industrial safety work gloves have to be properly fitted to ensure maximum hand protection. When ordering your new work gloves, the measurement of your hand must be taken. To do this, place the measuring tape around widest part of the hand and record this measurement. The second measurement to take is the length of your hand. This measurement is achieved by measuring from the middle finger, which is usually the longest, to the beginning of the wrist. Use these measurements to check the manufacturer’s recommendation on the size of glove to order. If your work glove will have special features such as knitted cuff, it is also a good idea to measure the circumference of your wrists as well. Overall there are lots of components that should be considered during the protective gloves’ selection process, and each element is equally important to ensure that the gloves give sufficient protection. But again, gloves – as well as any other PPE – are the last line of defence according to hierarchy of hazard control, and their effectiveness remains limited and requires additional effort to control. If you are reading these lines I am sure that you should already have some clarity regarding which protective gloves and for which task should be used by your workers – but how do you implement this in reality? How do you change ‘normal’ working practise, which might have been established for years at some productions already? Now it is time to make a change – and it might be that this stage is a most painful and complicated one, because it involves people’s behaviour, habits, perception and so on. Change is always uncomfortable for those who have to change. The implementation of protective gloves is a not an exception. 1. Stress the topic or highlight the potential outcomes if no changes are made. Also outline the benefits for workers. The workforce should understand and genuinely feel there is something positive to gain from making the change. 2. Train people on how to select right size glove, how to use, inspect and maintain it in good condition, and how to dispose of it properly. Protective gloves training should not be too complex, but has to include some main general points – see examples right. Hand injuries are one of the most frequently occurring injuries in the workplace. Successful hand injury prevention requires your commitment, participation and communication. 1. Schedule a trial for a small group (e.g. for one crew) and make sure that date, length, location, goals, and expectations of the evaluation or trial is clear, so you may see results for a specific date. 2. Collect and analyse together with a departmental team trial outcomes from testing crew. 3. Make a change or correction into programme if needed, based on the feedback if feasible. 4. Get confirmation and approval or agreement from testing crew about protective glove application – this is one of the best ways to share the importance and benefits of protective gloves with all workers. It does not really matter if you’re in the construction industry, agricultural business, or a related field, you need heavy duty work gloves to provide protection to your hands. Industrial work gloves can provide a safeguard against cuts, abrasions and other potential injuries. Make sure you buy the appropriate industrial work gloves suitable for your needs.